It is no secret that Norwegians (and others) travel to the Canary Islands to party. The food might be uninteresting, but there is cheap alcohol in abundance. The hot weather does taking a drink even more tempting during the day, and there are no shortage of bars and taverns to satisfy that particular urge. 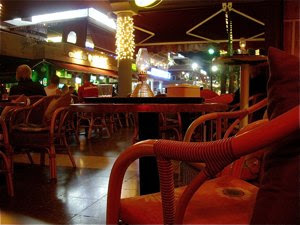 Here are a few bars we visited during our stay at Playa del Ingles. This bar seemed like a kind of a joke. Its name refers to the Norwegian State Social Security bureau. Does this indicate that many social security clients frequent these premises? I do not know, but the name left us with a good laugh. Located by the Yumbo Centre at Playa del Ingles, it was a place for us to visit - once! Norwegians were sitting everywhere chatting to each other, or reading one of our newspaper for sale nearby. If you want, you could enjoy Norwegians specialties here as well, as Spekesild, salted and smoked herring with you cold pint of lager. Gio Bar is a giant leap from Norwegian culture to gay culture. The area around Yumbo Centre is packed with gay restaurants, bars and clubs. The rule here, is as everywhere - if you've seen one, you've seen them all. Still we liked Gio Bar, on the ground level of the Yumbo Centre. 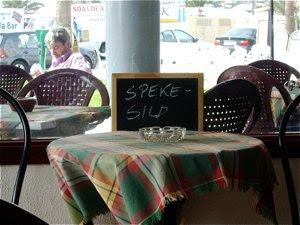 They served great drinks and was located just by the promenade, so you could peek at all the people walking by. And it was not entirely gay, as it attracted youngster and straight people as well. A good thing - if you ask me!! If you are looking for a beach side bar, I will strongly recommend Paddy's by the Sea by the Faro lighthouse at Maspalomas. This is the hangout after a swim or a walk by the beach. One thing that stood out was a framed t-shirt with the signature of Nick Faldo, the famous golfer. Whether he had dropped by for a drink here is unknown. 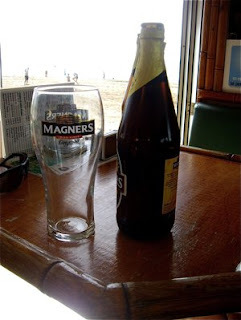 Whe substituted our cold lager with a Magners, a deliciously fresh Irish Apple cider served in pint bottles, a more generous sized portion than the regular 50 cl we usually get in our metric world.